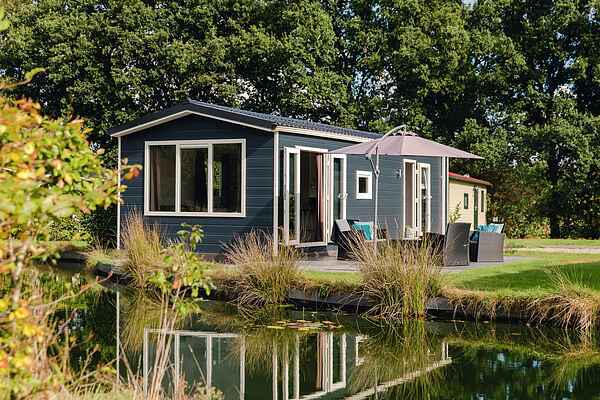 The chalets on the small Buitenplaats Holten are of high quality and are beautifully situated. All types are next to, or near, the large pond. You can choose from multiple 4-pers. chalets on this holiday park; they are similar in terms of comfort, but each has its own individual identity. The 4-pers. chalets are NL-7462-01 / NL-7462-04 / NL-7462-05 /NL-7462-06. For six people, you can choose between NL-7462-02 and the slightly more spacious EN-7462-03. NL-7462-06 is not next to the pond and is, therefore, best suited for young families. You have a beautiful view across the pond from the other chalets. All chalets have a beautifully maintained garden complete with patio.